Ferry to the Far East. DBS Ferry Eastern Dream, Sea of Japan. 22nd October 2014. The city and docks of Vladivostok disappeared from view and that was the end of my Russian adventure. Looking forward to Japan but a two day voyage to survive before we got there. Our little party went down to the lounge and settled in. 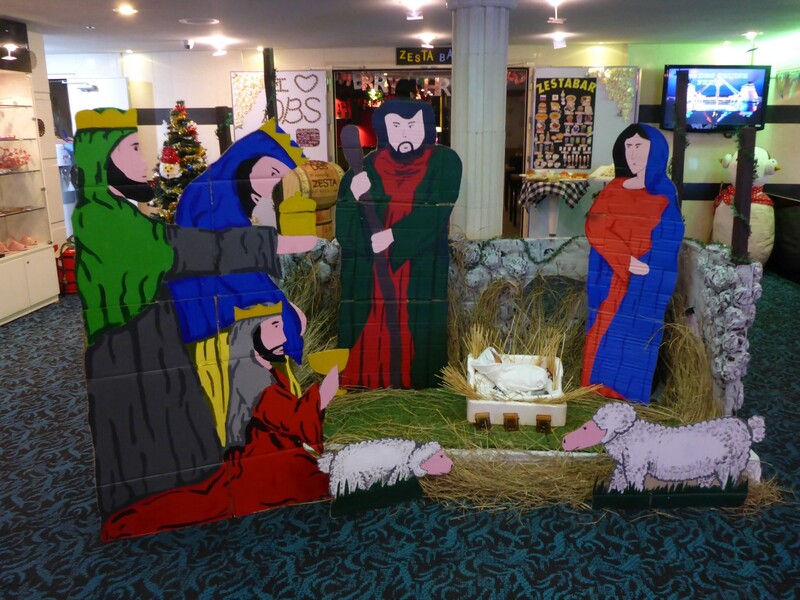 DBS Ferries gets into the Christmas mood. We enjoyed the rest of the day, swapping experiences and making plans. My bunk and cabin were comfortable and I was lulled to sleep by the sound and feel of the ship’s propeller shaft turning the screw and ferrying me to the next chapter. Hans on the right and the French family Blandin. 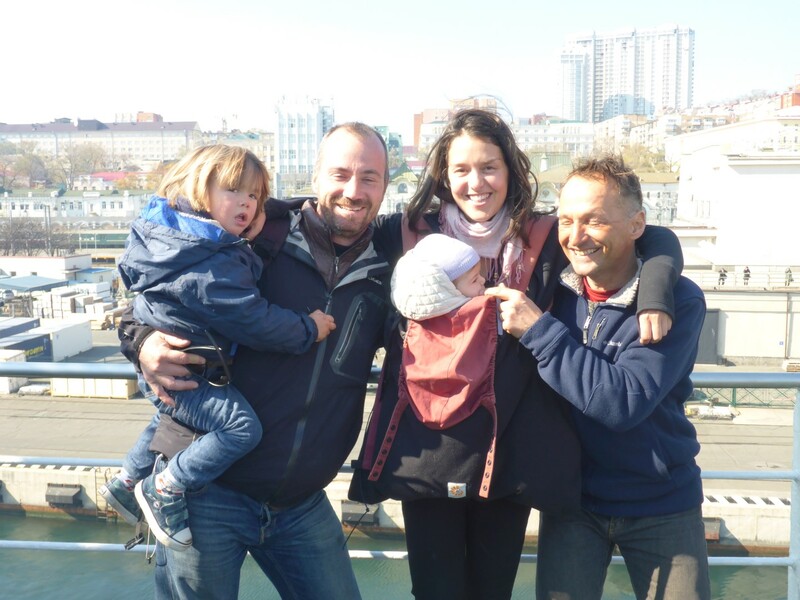 When the ferry docked at Donghae, Korea, Hans and I said goodbye to our French and Swiss friends but didn’t rush to get off the boat until we were made to. We weren’t in any hurry. While we were going through immigration we had to put up with a drunk and obnoxious Russian who was being taken charge of by the port security. He had a bloody nose. Whether he slipped or was slapped I don’t know. The latter I hope. Him and his friends were the first Russians I’d seen behaving in that way. No different to some Brits abroad I suppose. This was made up for by our meeting Maria, a pleasant Danish woman, and her father Peter. They’d travelled across Russia on the Trans Siberian Railway, stopping off at various places on the way, and were now going to Japan. Chatting to her I discovered that she was a Ship’s Captain. A very unusual job for a woman, even these days. It seemed she’d been on an Operation Raliegh type trip when she was a teenager and decided to take it up as a career. She’d worked for the large Danish shipping company Maersk, who had put her through all the necessary training, such as navigation, and she’d worked her way up to Master Mariner, at forty years old. She now worked freelance and loved her job. Great to see the barriers of tradition being broken down. Captain Maria and Peter, her father. Hans and I spent our time in the terminal using the free wi-fi before going back on board for the second leg of the trip. 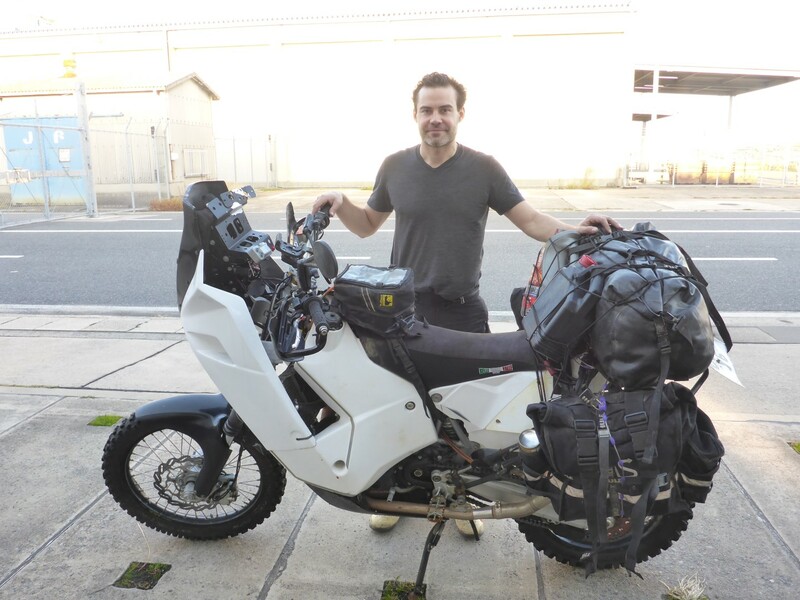 We were joined by Lukas, an Austrian biker who had taken a break from his corporate world and had also ridden across Russia, Kazakhstan and Mongolia. He and two friends had tackled some of the tough Russian tracks that I had wanted to attempt but from what he said of their condition it was as well that I didn’t. They were in a very poor state after a lot of rain and I could tell I wouldn’t have got through on my own. I was pleased that I’d let discretion overrule valour. The ferry was much emptier on this leg so we had a quiet time and a peaceful night before docking at Sakaiminato port at about 10 am. I said goodbye to Hans with the promise that I’d visit him when I got to Australia. Next job was to get all the paperwork done to release my bike from customs. Lukas and I were aided in this by Tatianya, a lovely Russian woman who spoke English and Japanese. She was the port agent for DBS Ferries. 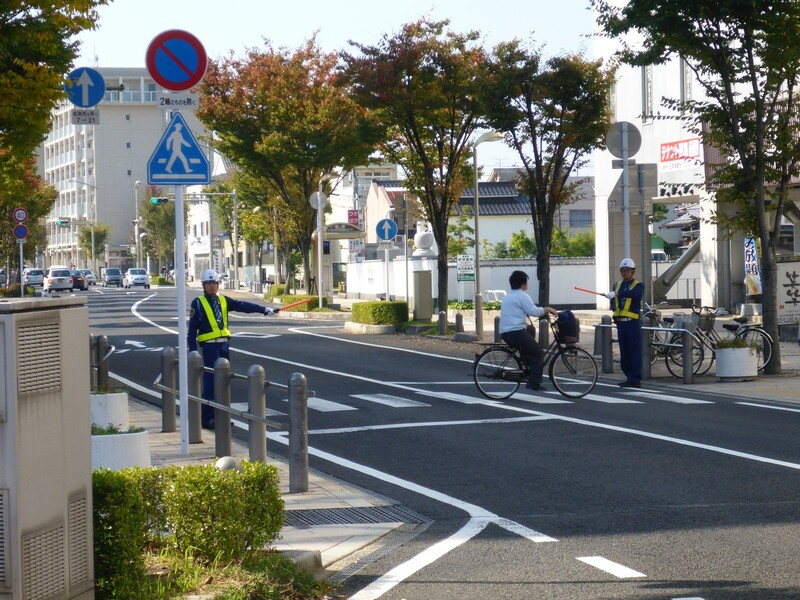 We were taken to the Japanese Automobile Federation offices in town to get our carnets authenticated first, then back to customs so they could stamp them. Then the bikes were ours. Tatianya had arranged for an insurance agent to come to the ferry offices so I was able to buy some cover for the bike. Two months for about £30. I was happy with that. It all took about three hours I suppose. No tales of struggles against the might of bureaucracy to tell here I’m afraid, just efficient service. Lukas and his sickly KTM. He sent a box full of spares ahead to Tokyo ready for an engine rebuild. 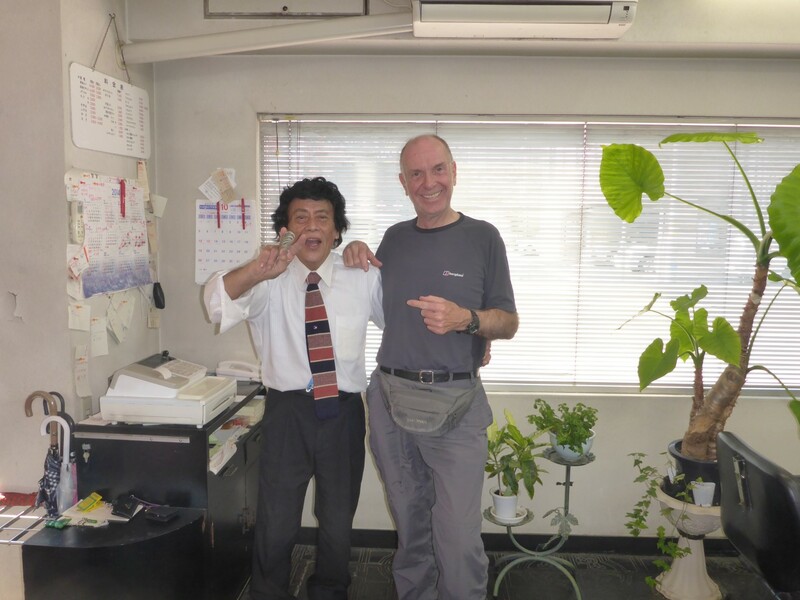 Tatianya had given me details of a hostel in the town of Matsue so that’s were I headed. I posted my IDP application form at the Post Office en route, something that was now urgent. The hostel took a while to find but I managed it eventually. I was pleased at this little success as I had no Japanese maps at that time. Just a small leaflet type town plan that I’d got from the port and a hand drawn copy of Google Maps. Number one job was to download some maps for my Garmin GPS from the web, something that I kind of knew how to do but hadn’t actually managed to achieve yet. I booked in to the hostel for two nights and went out for a walk. I found a restaurant called Wara Wara and went in. It was a while before I was served but the menu had pictures on it so I was able to point and ask. The food arrived quite quickly once I’d ordered and was nice enough although mostly fried. It was also time to rediscover my chopstick skills. On the way out I saw lockers by the door where people had put their shoes. I probably committed a cardinal sin by leaving mine on but at least I now understood why the waiters walked around in their socks. 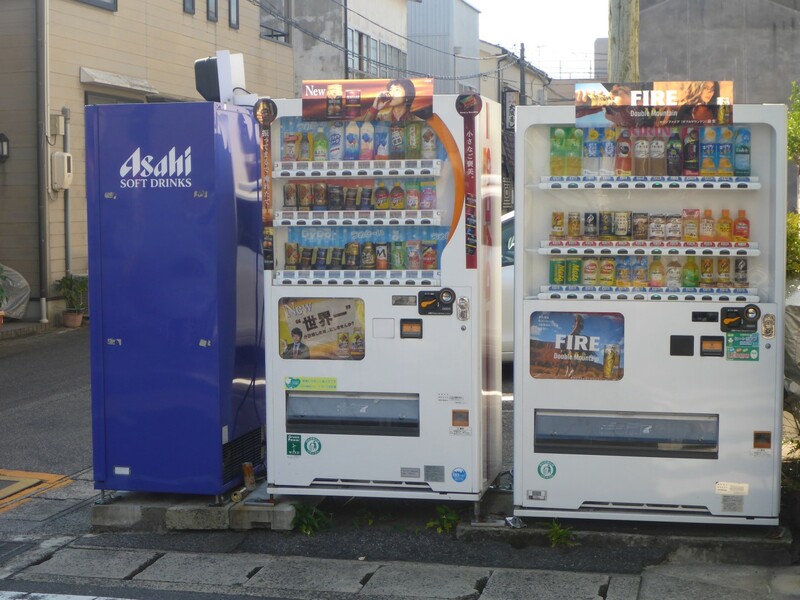 Streetside vending machines, including cans of hot coffee. Opposite the restaurant was a convenience store where I could buy some fruit and a sandwich to see me through the next day. On the walk back I was surprised and impressed by the number of vending machines I saw selling canned drinks. A closer inspection revealed that they were selling both cold and hot drinks. Hot coffee in cans! A new one on me. I couldn’t help but wonder how long such a machine would survive on the average UK high street before being robbed and vandalised. 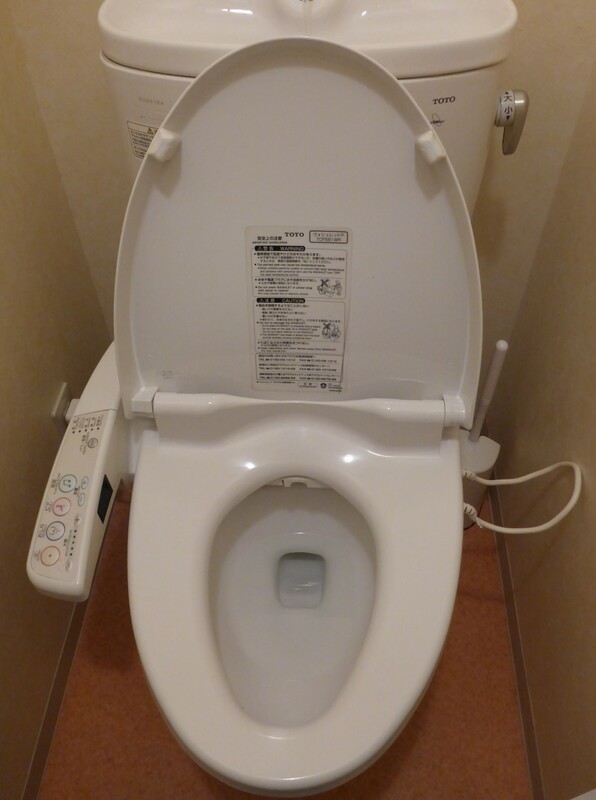 One of the things that I instantly liked about Japan was their wonderful idea of heated toilet seats. A trial run revealed that they also incorporated a bidet function with heated water and jets adjustable for strength. The symbols indicated different buttons for men and women. I just had to indulge in blissful experimentation! Well, wouldn’t you? Saturday in Matsue appeared to be some kind of celebration day. I’ve no idea of the reason but some local streets were closed off, with food and trinket stalls all along them, and there was a small square containing a podium with lots of seats on it. It was a sunny and warm late October day and the memories of a frozen Siberia soon faded as I walked around in T shirt and shorts. At a local shrine I saw a family enjoying some kind of celebration and I was allowed to take a photo of the young daughter in her traditional costume. Earlier I’d seen a school band getting ready to perform and eventually they marched down to the podium and took their places, explaining the reason for all the chairs. They were very good too. 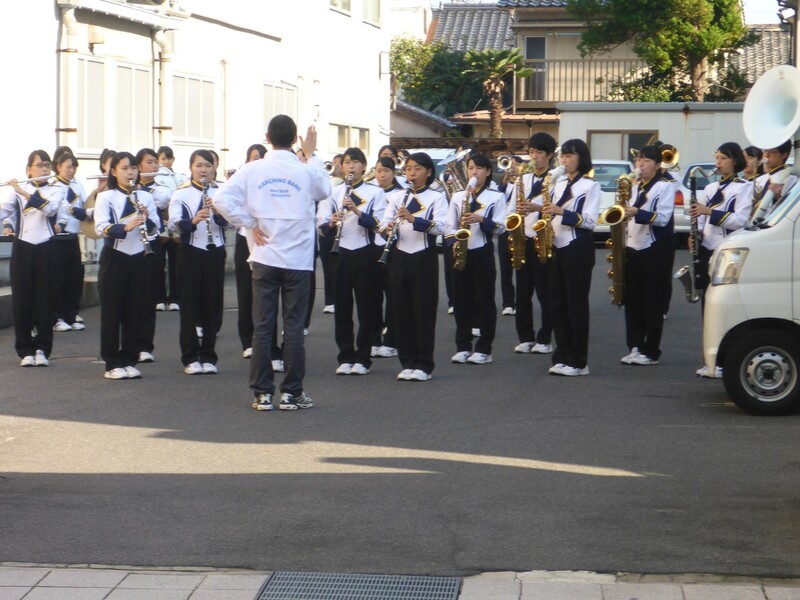 Smartly dressed school band before they marched down to the town square for their performance. 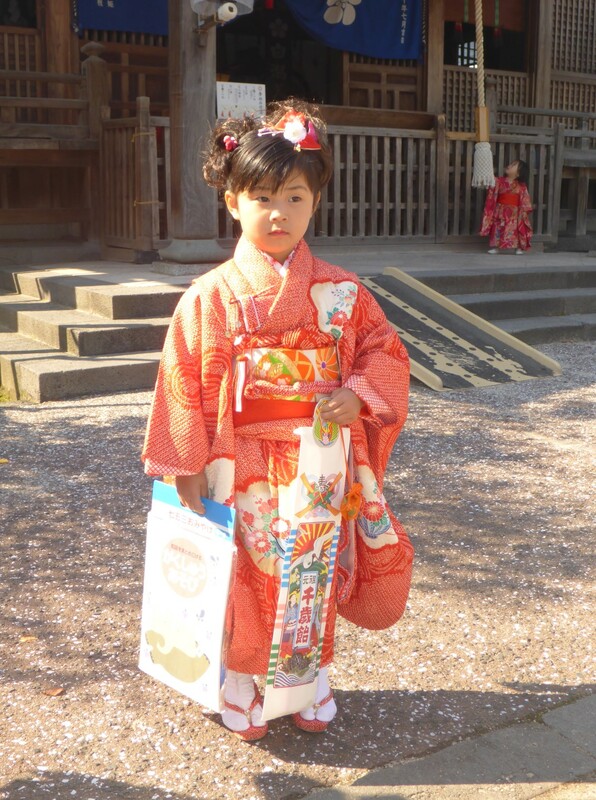 Traditionally dressed young Japanese girl. Earlier on I’d gone looking for a barbers and found one by means of the traditional red and white striped pole. Obviously an international symbol. The barber reminded me so much of Mister Teasy Weasy, the famous hairdresser from the 1960’s, only he was wearing a full on wig to maintain his air of hairdresser competence. He knew how to charge as well, relieving me of £18 for a trim. Ouch! Mr Teasy Weasy, with rug and fat wallet. I had my first proper Japanese meal of noodles and pork, eaten with chopsticks of course, in the cafe attached to the hostel. Green tea to follow. I got chatting to a guy who is a friend of the owner and had been doing some maintenance work there. He was about my age and spoke quite good English, having worked abroad. It was pleasant chatting to a local and he gave me some useful suggestions as to what to visit. The meal was quite cheap and I went to bed feeling that my first two days had been quite successful. 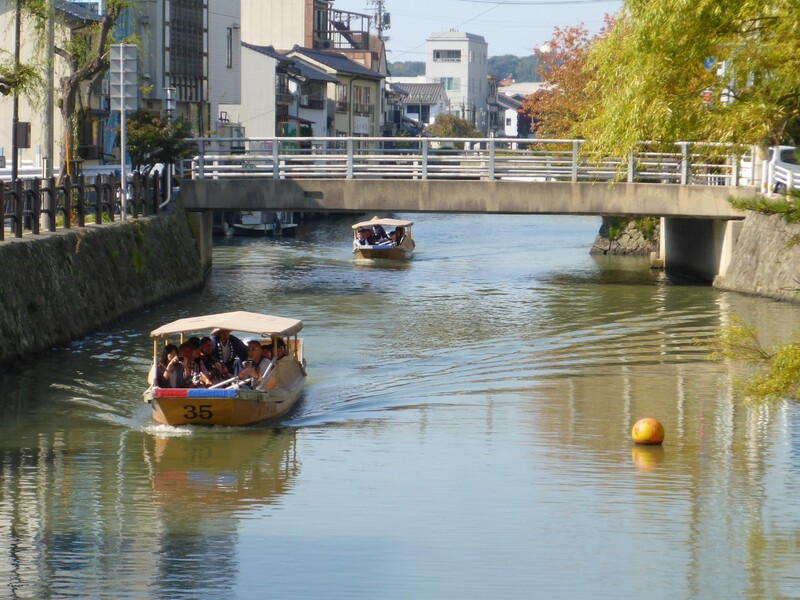 Matsue canal system with tourist boats. So what were my first impressions of Japan? Helpful and friendly people so far. I’d heard talk of how Japanese people don’t want anything to do with Westerners. Absolute nonsense. It’s clearly a well organised society with good infrastructure – road signage etc. Usefully in English as well as Japanese. Speed limits are 50, sometimes 40kph in towns and only 60kph outside, although I’m told the Expressways have a much higher speed limit. They drive on the left, no bad thing and easy to get used to even after six months of driving on the right. Drivers are well disciplined although they don’t rush. It seems to be that when traffic lights go green they think about what to do next for a couple of seconds, eventually decide to put the car in gear and finally pull away. I don’t think they’d last ten seconds in a UK city. I don’t know if that’s a good or a bad thing. I tended to be sitting at the next set of red lights by the time they moved. Maybe that’s the point! Japan has a very high proportion of old drivers and I’d been warned to watch out for their predilection for making sudden decisions and acting on them instantly. I’d had plenty of experience of people like that and had the broken bones to prove it. At the pedestrian crossings were guys wearing dayglo bandoleers and waving illuminated red sticks at the approaching drivers, who dutifully stopped to let the pedestrians across. Clearly a well organised society. There are small convenience stores everywhere, Lawsons being one that I’ve seen plenty of. They sell some basic essentials but also sandwiches, fruit and hot snacks. Oh, and very delicious and cheap coffee, about £1 for a large cup. As my journey progressed I came to love these places and I even obtained a Lawsons loyalty card. Their down side is the very delicious sweet and creamy cakes they sell. Japan is a very crowded country. It is about half as big again as the UK but has about twice as many people. There are three main islands, on which most of the population live, and several smaller ones. They tend to have mountainous areas along the middle of them which makes the coastal areas very populous. As I rode around I found that one town would often run into another. Cities are very big and full of apartment blocks. One very noticeable thing was how houses tended to be different to one another. Very little by way of neat streets with well established terraces or semi’s, as in Europe. Buildings are either wooden or made from preformed materials such as cladding. They have to be earthquake resistant so brick is not a practical material anyway. I had found Matsue to be a gentle and pleasant introduction to Japan but it was time now to venture forth to a big city, Kyoto. 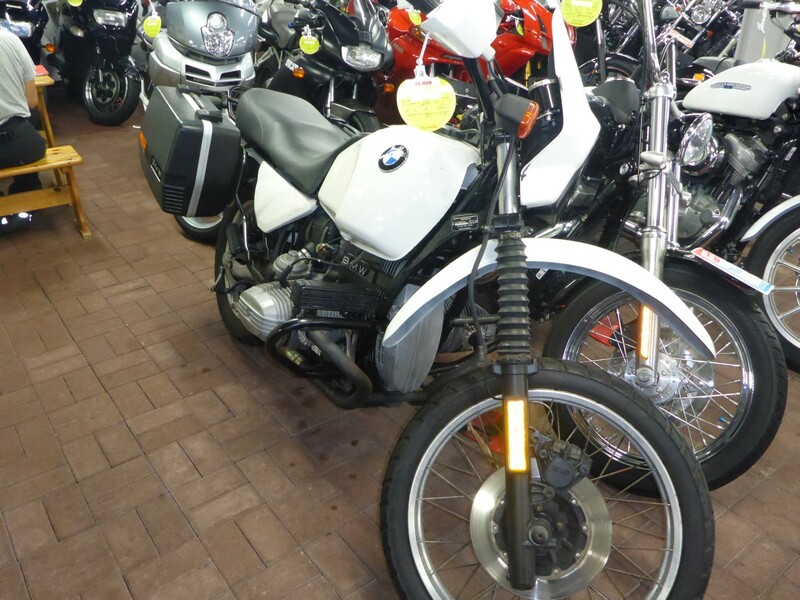 BMW R100GS. A rare beast in Japan. 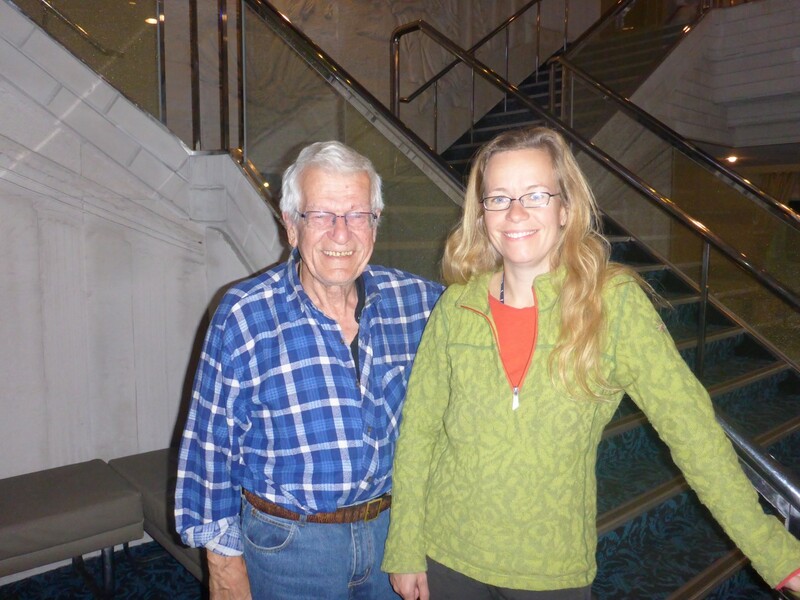 Geoff, it was a pleasure meeting you in new zealand, and since then I have really enjoyed reading your travel blog. Your travels are an inspiration, and I hope that in time I will have lived a life filled with such adventures as your own. Japan is on my short list for my next destination! I eagerly look forward to the day when our paths cross again. Stay safe, take care of Doris, and enjoy every moment, my friend. Hi Geoff. Thanks very much for your kind comments. It was a great pleasure meeting you too and I hope the rest of your trip went well. An email is on the way to you. Thanks for starting to fill in the gap between Siberia and New Zealand. Keep it coming. Will do David. I’m working on it right now!